Thank you for all the wonderful birthday wishes. The Divas were extrememly happy to share their birthday creations with you. There are have many fabulous cards submitted so far and we would like to showcase a couple before the winner is announced on Tuesday. Fell free to grab our badge. 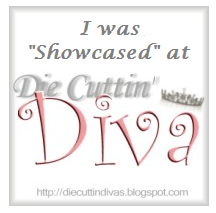 Be sure to check each Divas site for goodies. You still have a few days to enter this challenge. The winner will be announced next Tuesday. Please remember to include which die-cut you used and a link back to our site is appreciated.